It wasn't entirely alone - the movie offered a couple more shots or jokes that implied a subversive streak in the producers. But saying these were few and far between is an understatement: I counted four, most of which were blink-and-you'll-miss-it moments (including one where we had to rewind the movie to verify that, yes, a present was incinerated by rockets). But I'm getting ahead of myself - let's synopsize. This opens on Christmas Eve with Santa dropping off a gift at the house of Julia, who owns two cats. Similar to the movies it's ripping off, these are talking animals, but don't expect the same production values. Keep in mind, the effects in The Search for Santa Paws were already of the bargain basement variety; this time, they're several steps below what you expect from Youtube videos. The mouths are horrifically malformed, to the point I can't tell if it's incompetence or some failed attempt at subversion. Either way, you're rarely subjected to it: more often than not, the camera focuses on something other than the speaking animal to save money. At any rate, it turns out Santa is horribly allergic to cats, leading him to sneeze uncontrollably, fall over, and break Julia's present. In the process, he's seen by her and her next door neighbor, Marcus Bramble. Presumably, the two cats we just met are long dead, and Julia's now a single mother raising her son, Tommy, in the house she grew up in. Marcus still lives next door, and he's obsessed with Christmas and Santa. Julia, however, refuses to let Tommy observe the holiday, and she insists Santa doesn't exist. Oh, there are more cats: a mother and three kittens. After a tedious series of mishaps, Julia decrees that they can't afford to keep the kittens. Tommy, in an act of defiance, sneaks in a small Christmas tree in the hopes of sending the three kittens with Santa instead of offering them for adoption locally. Normally, I'd say this makes more sense in the context of the movie, but not this time. This thing was rife with non sequiturs and random twists. Characters would vanish or appear for scenes without explanation, and no one's motivation made a damn bit of sense. Anyway, Tommy leaves Santa a box of kittens and a note, which he takes up to the roof before realizing what's enclosed. When he does, he sneezes uncontrollably, falls off the roof, and is knocked unconscious. The reindeer explain to the kittens that they'll have to fill in, and they take off in the sleigh after an interactive tutorial which may or may not be a live feed to an elf at the North Poll (both interpretations are contradicted by the movie). While they're delivering gifts all over the world (and escaping a psychotic child who wants to play dress-up with the kittens), Tommy rolls Santa inside and works on reviving him. Marcus, meanwhile, battles with the kittens' mother for some unexplained reason. Once Santa's awake, Julia finds him and freaks out. He uses magic to prove he's the real Santa and psychoanalyzes her hatred of the holidays. Turns out, after she saw Santa as a child, no one would believe her. This led her to hate Christmas and deny the truth to her son. Marcus, however, endured the bullying, because he was stronger, so Julia resented him, as well. Oh, good. For a moment I was worried we were going to get through this without any sexism. Backstory explained, all her problems are solved. 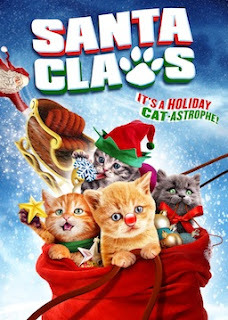 And Marcus, he puts on Santa's hat and realizes the true meaning of Christmas is saving the stupid kittens who are now running on a sheet that the filmmakers really want us to the believe is a snowbank. Oh yeah - they crashed when they were almost through delivering the gifts. Marcus manages to hack into Santa's sleigh and help the kittens activate the back-up rockets, which get them back. Everyone's reunited, and the remaining plot points are solved or forgotten. It's difficult to convey how little effort was put into this, outside of the aforementioned handful of bizarre moments. The writing was astonishingly lazy, and the actors weren't trying, either. It was crappy film-making at its crappiest. But occasionally - just for a moment - that "so bad it's good" magic tried to break through. I kept wanting them to bottle that sense of the bizarre and run with it, make that the tone of the movie. There were trace elements of B-horror weirdness interspersed here and there. But they were never more than that. Whatever momentary flash of interest they'd inspired fizzled just as fast, and we were thrown back into an abyss of boring stupidity.